Nestled in the rolling hills of middle Tennessee is a tiny town famous for whisky. Every ounce of Jack Daniels is produced in Lynchburg, Tn. This ironically dry county hosts the Oak Barrel Half Marathon every April attracting 1500 runners from 30 states. 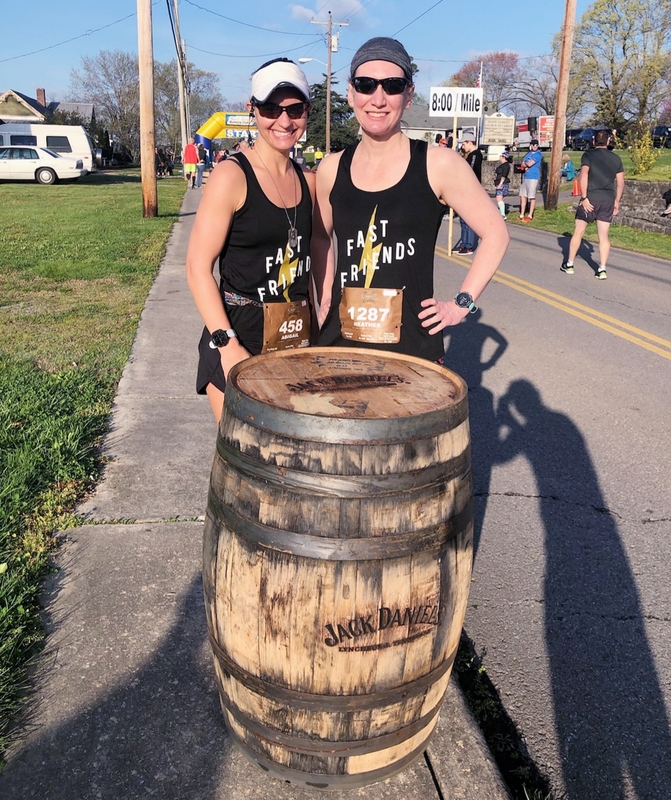 Over the last few years, I’d began to hear that the Oak Barrel half was a fantastic race, but the endorsement always came with the disclaimer to beware “Whiskey Hill”. The first challenge was getting a bib. The race is sells out quickly. I’m talking “Disney fast pass for Pandora” quickly. I set my alarm for early on the Sunday morning that the race went on sale and was able to get a bib in about 10 minutes. A friend who signed on an hour later, was not so lucky. I checked the finish times from last year and realized that if I had a really good race it was possible for me to place in my age group. However, after talking with some people who had run it the year before I realized how crummy the weather was in 2018 (30’s with drizzle) and that was likely reason for slower times. Abby and I trained diligently for “Whiskey Hill” in the early mornings when it was dark and cold. We added hill sprints to our speedwork and rolling hills to our tempo run. Abby (my best running friend/ training partner), Russ (my husband) and I drove up the morning of the race. The drive from Franklin is about an hour and 15 minutes of windy back roads and small country towns. We stopped at a gas station in Shelbyville on the way. As I stood stretching in the corner, the cashier asked all the “regulars” that came in if they wanted their “usual breakfast sandwich” or “the special”. I love that sense of community. That’s REAL Tennessee, where you can be a “regular” at the gas station. 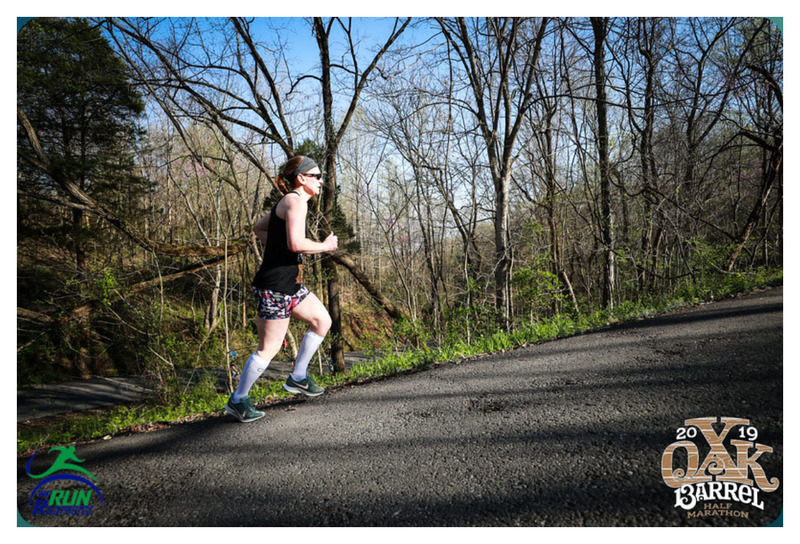 The race started at 8 am, right after the Tennessee fog had dissipated from the hill tops. I had studied the topography of the course and broken the race up into 4 segments on my garmin. The Race started with 4 flat-ish miles. My goal was not to go out too fast, so I set my garmin parameters to keep me around an 8:10 pace and this felt comfortable. The scenery was gorgeous, filled with green grass, wild flowers and lots of trees which provided much needed shade later in the race. The course wound in and out of the forest and farmlands which were stocked with (sometimes malodorous) livestock. The first half mile was a little crowded, but after that the crowds thinned and I was able to dial in my pace. Mentally, it really helped to be able to break up the race into manageable chunks. Whiskey Hill was no joke. At mile 4 I reached the famous “Whiskey Hill”. This mile is the toughest mile of the race with an elevation change of 380 feet. We knew this was coming so we had trained with lots of hill workouts, even adding ridiculous hills into our tempo runs. Inflatable arches at the bottom and top of the hill mark this grueling segment’s beginning and end. There is also a special award for the man and woman who runs this section the fastest. They get the title “King (or Queen) of the Hill” and a coveted pok-a-dot t-shirt to wear with pride. I set no pace parameters on my garmin while running the hill. I told myself that my goal was to go as slow as I needed to to reach the top. The hill was challenging in the lower half, but gets steeper as you reach the top. The last few hundred feet were crazy steep; but I did manage to run the whole thing. After climbing the hill, the next four miles were mostly flat along the top of the plateau and these were unexpectedly hard for me. Mentally I was planning for it to be “easy” after I finished the hill, but I underestimated the fatigue in my legs. Also the plateau was not as flat as I thought it would be. There were several small hills. Even though they were short segments, some were quite steep. This is where I mentally started to struggle. My legs were tired and I realized I had a long way to go. I was having to push to keep my goal 8:00 pace. I kept telling myself “You are tired, not hurt. You can push through tired; you always do” and “Run the mile you are in”. I always run without music in races, but I think I will try music next time to see if that helps with the mid-race mindgame. Russ finished strong in his second half marathon at Oak Barrel. I ate my GU at mile 8 and then zoomed down the hill at mile 9. Once I hit the down hill section of the race I set my garmin to keep me under 7:55 pace, with no max pace. I felt so strong and energized after flying down the hill that I almost went “all out” but thankfully I decided to hold back until the end. A painful “side stitch” hit me that last mile and left me feeling short of breath, so I’m glad I didn’t push it too early. As I rounded the final stretch, I cruised past the distillery and made a left into downtown Lynchburg. 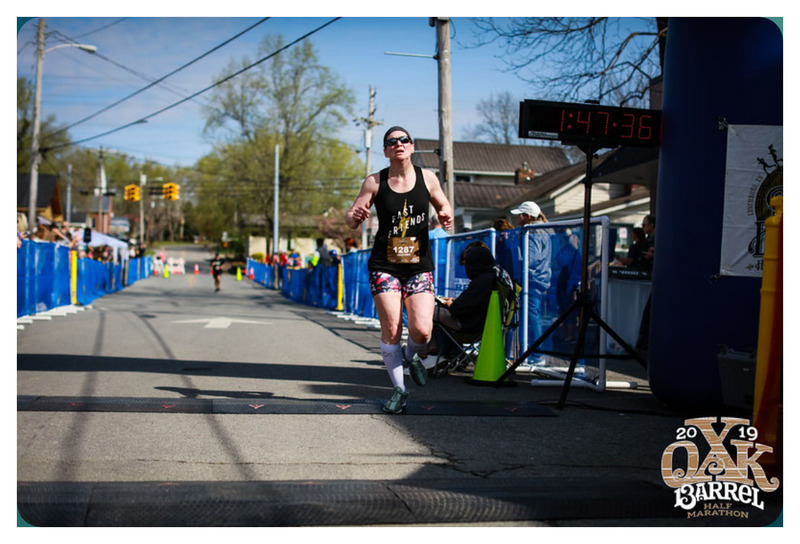 When I crossed the finish line, I had nothing left. I had given that course my all. I inhaled some water and headed back out to cheer on my running partner Abby, who came in shortly after me. As I walked back to the finish line to find her, I stopped by the leader board and saw my name at the top of my age group. I won my age group. I couldn’t believe it. I was sure that the weather would make for a faster course and I wouldn’t have a chance, but I was overwhelmed with emotion when I saw my name. All those early morning freezing hill sprints in the dark had paid off. So thankful for to have such an awesome runner friend who lives a block away. I have lost track of how many races we have trained for together. As I wandered across the square looking for Abby, the band began to play the Billy Currington song, “People are Crazy” and I just sat down and cried. This was my dad’s favorite song and I hadn’t heard it since he passed away 4 years ago. I always think of my dad when I race, but the scenery, paint horses and farms along the course had already left me a little misty eyed with memories. That song, just put me over the edge. It wasn’t grief per say; I was simply overwhelmed with the sweetness of my memories of my father at such a special moment for me. Abby eventually came to rescue me and we rewarded ourselves with some of the free food in the quaint town square. There were tents with hoe cakes (cornmeal pancakes), grilled cheese sandwiches, delicious beef stew and pimento cheese sandwiches. They were all delicious and free. We then collected our free socks and went to meet up with Russ (my husband). We missed him finishing; as his time was faster than I thought it would be for his second half marathon (Go Russ!). We hydrated and hung out for another hour until the awards ceremony. 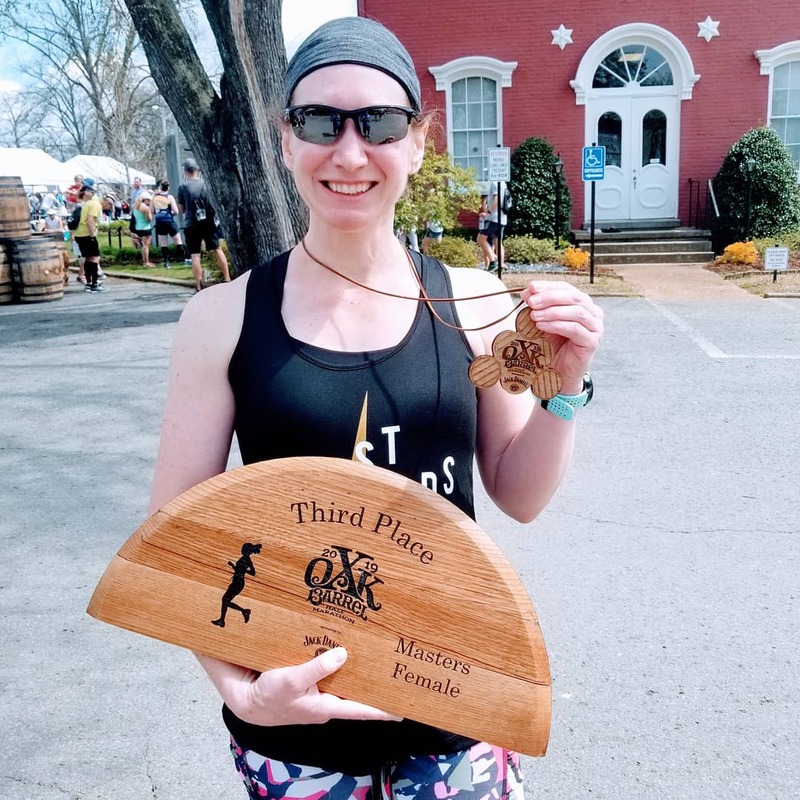 As they began to announce the winners, I was shocked to hear my name called for third overall in the female masters category. I jumped up and down and squealed like a teenage girl meeting her favorite boy band. I have placed in my age group a couple of times in smaller races, but have never placed in an overall category. The “trophies” were made of the tops on the Jack Daniels whiskey barrels. 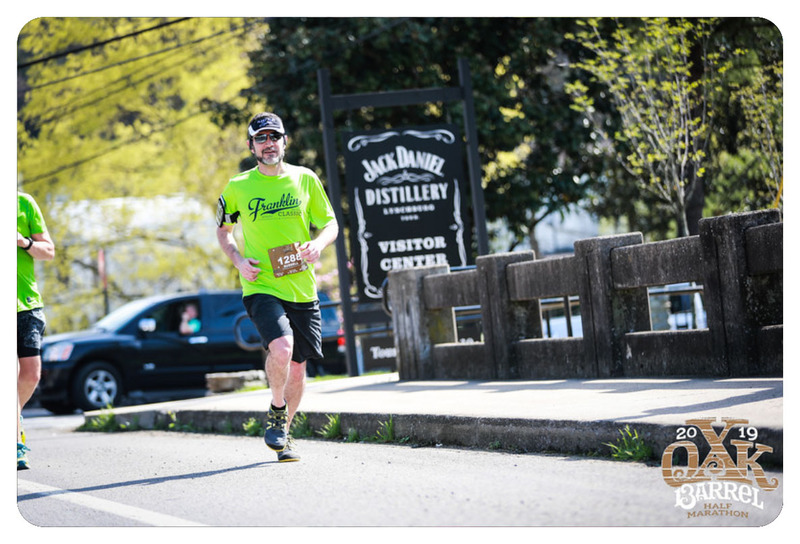 The Oak Barrel Half was challenging; but that it also what makes it so awesome and rewarding. The scenery and swag were great; but it was all the volunteers who came out to help that really made it a special race. I will definitely set my alarm next year to get up early to sign up and come back to defend my title as “The Third Fastest Old Lady”. Stay tuned for my next challenge: The Wine Glass Marathon in October where I hope to qualify for Boston. 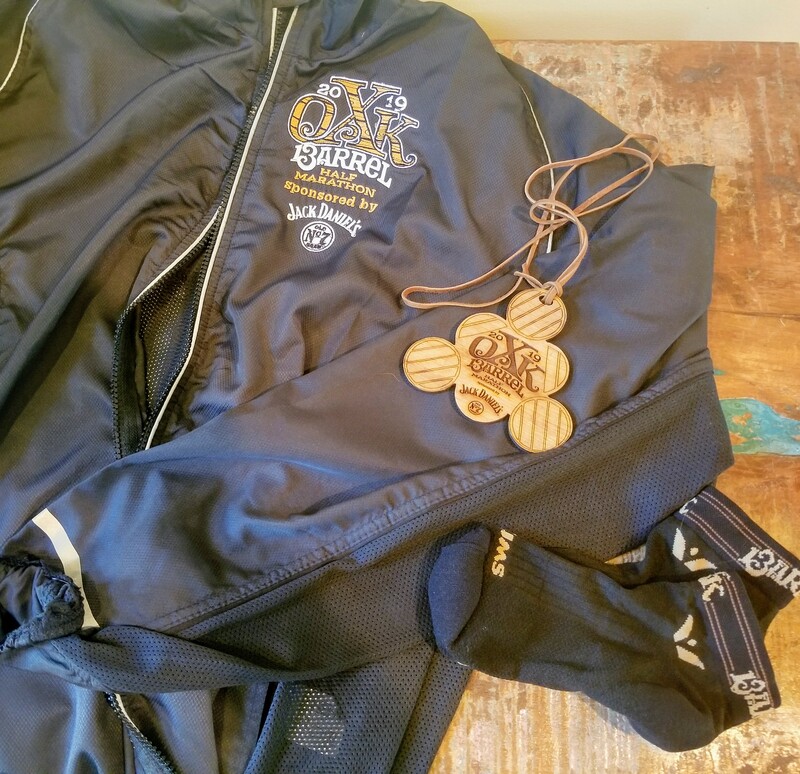 Race Swag: Windbreaker, socks and a “medal” made from whiskey barrels. 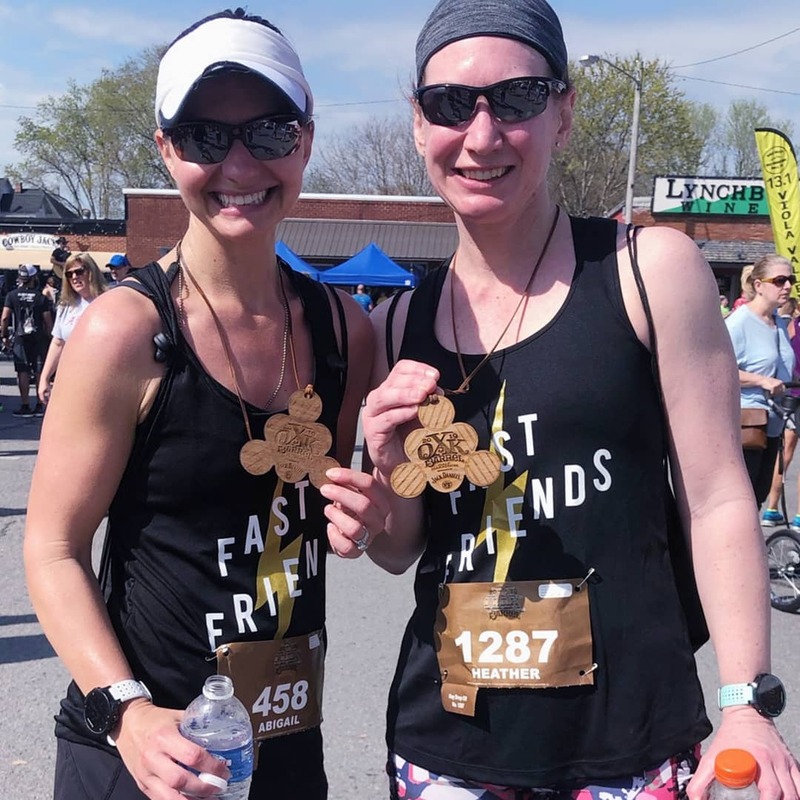 This entry was posted in Running, Uncategorized and tagged Half Marathon, half marathon training, oak barrel half marathon on April 10, 2019 by drrupe. Well done! That’s awesome! And looks like a really challenging course, so that’s a brilliant achievement!